SCARY HORROR STUFF: Will the Latest Cinema Nostalgia Trend Prove Profitable for the Horror Genre? Ask Jamie Lee Curtis! Will the Latest Cinema Nostalgia Trend Prove Profitable for the Horror Genre? Ask Jamie Lee Curtis! You have to admit that part of what makes a horror icon are the actors themselves. Simple as that. Well, maybe except for hooded or masked figures, because as long as the actor knows how to walk "menacingly" or deliberately while holding some sort of sharp object, the effect's definitely doable. More importantly, what makes that horror icon shine happens to be the protagonist -- Nancy Thompson of A NIGHTMARE ON ELM STREET, Ellen Ripley of ALIEN, Sarah Connor of THE TERMINATOR. They are the beacons. Returning to the role that made her the phenomenon she's always been to this day. Of course, I can't help but think that this is a trend we've been seeing quite often: Harrison Ford returning for THE FORCE AWAKENS and BLADE RUNNER 2049, Mark Hamill for THE LAST JEDI, Sylvester Stallone for the remarkably well done CREED. And the trend isn't really the same as, well, they're coming back after maybe five years. No, they're coming back after freaking decades of not touching the material of the roles they made so popular back then. It accounts for a lot of remembrance and backstory, making the roles that much richer to experience. I think that's honestly one of the reasons why these films ended up doing so well (with the slight exception of BLADE RUNNER 2049, although a true masterpiece in my opinion). How is this trend different than your average "sequel"? Laurie Strode is not the same person we saw at the very latest back in 2002 when HALLOWEEN: RESURRECTION came out. 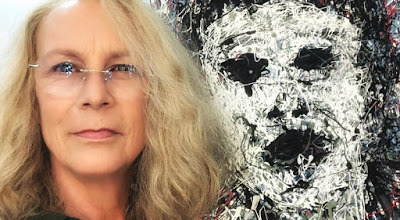 In fact, this Laurie Strode for the newest film tackled by horror studio Blumhouse will be a true-to-form return, an actual sequel to the original film. In other words, the other films you may remember? -- They're, for lack of a better term, "de-canonized" from the cinematic universe (especially, if you remember, Laurie Strode ended up dying in the 2002 film! That, and Resurrection kind of sucked testicles.). Blumhouse's take on this will hit theaters on October 19, 2018, and they just wrapped on the filming. Jamie Lee Curtis had mentioned on Instagram that the newest film will make everyone "very happy and VERY scared." The truth is those Halloween movies declined gradually over the years. H20 probably held onto the icon a bit more, but after that Michael Myers ended up being nothing more than a disturbed man wearing an old William Shatner mask. The feel just wasn't there anymore. However, perhaps this new trend we've been seeing will be just the right kind of fresh air tainted with the smell of coppery blood that'll nourish those brands in the correct way. You have to remember what we'll be dealing with come October: this is Blumhouse, man; and the true Laurie Strode, back in the game -- but in a way that's not "shoehorned" in -- and anchoring the brand and the story in a way that Han Solo and Luke Skywalker anchored episodes 7 and 8 for Star Wars. Who Knows: You Think We May End Up Seeing Robert Englund Bring the Claws Back for Freddy Krueger? Or Maybe Heather Langenkamp in her '50s? Should we remind you that Linda Hamilton will be returning to her iconic role of Sarah Connor, too?? Along with the true director of the machines, Mr. James Cameron? Are we convinced now that this nostalgic universal trend of actors returning to their roles from way back when has hit full force? Bring it. I think the horror genre will love it.